If you have a large group that you need to show around town in style, and they happen to love the great outdoors, be sure to consider this list of popular warm-weather attractions. If you live in Greater Toronto, you may already know them. If not, consider these trip destinations a must for your next group visit to Toronto! Rouge National Urban Park is going to be one of the largest protected urban parks in the world. It all started with Rouge Park, which, in part thanks to Transport Canada transferring another huge tract of land to Parks Canada in 2015, is going to double in size. This also happens to be the first park in Canada to get the “National Urban Park” designation. Visit the park and see 1700 species of plant and animal life, take a trip through more than 10,000 years of human history, and see some of the best that nature has to offer here in the GTA. Parks Canada volunteers and staff are on site, ready to answer your questions as you enjoy the wildlife sightings, nature trails, fitness activities and more. This gem of a park is located in the Toronto Island Park area. Inspired by the main character in a popular series of children’s books, it offers a diverse range of activities. Children can take their pick of storytelling sessions, exploring nature on the Snail Trail, fun games in the Hide and Seek Garden, wildlife sightings, child-friendly sculptures, crafting, gardening, and so much more. 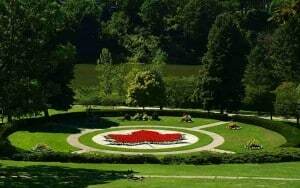 High Park is rated as one of the top things to do in Toronto on TripAdvisor for good reason. You could easily spend most of the day here and still not see everything that it has to offer. Bring your hiking shoes and enjoy one of its many nature trails and the beautiful plant life that surrounds you. Then take a leisurely stroll through the zoo. Grab a bite to eat – order it as take-out and you have the perfect excuse to enjoy a picnic! There are designated picnic areas available, but you can also go old school and just find yourself a soft patch of grass to relax on. If you’re lucky, you’ll get to enjoy the show made by squirrels scampering about – there are many of them that make their home in the park. After that, you could take a walk through the Chinese gardens. If you’re there at the right time of year, you’ll also be able to see the Japanese cherry trees in full bloom! They bloom in April or May, depending on how quickly the weather warms up. Almost everyone feels better after spending time outdoors. When planning the next charter bus trip for your large group, make sure that you don’t overlook great destinations like Rouge National Urban Park, the Franklin’s Children’s Garden, and/or High Park. Remember, bus transportation for your entire group is less expensive than you’d think and a great way to travel to or within Toronto!